Any copyrighted items are posted here for "nonprofit educational purposes" (one of the criteria of "fair use", Copyright Act of 1976, 17 U.S.C. § 107). Original content (c) Manfred Helfert 1996 & 2010. Ronald Sukenick, Down and In, Collier Books, 1987, New York, NY, p. 88. 'Cambridge was one of the navels of the cultural period, and a lot of influence came out of it. 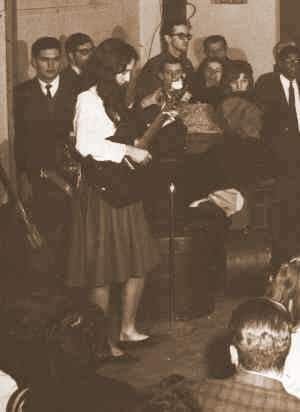 It put a lot of intelligence into the guitar movement, and the guitar movement was the forerunner of the peace movement. It made people aware enough to allow the peace movement to enter people's consciousness. Between Elvis Presley and the folk singers, the guitar movement enabled kids to believe in youth and the correctness of their own thinking. So when the peace movement started, they didn't buckle under at the first signs of parental authority -- the people who said, 'You're Communists. Shut up and crawl under a rock.' "
I vividly remember Bob Dylan™ coming in as a really scrawny, shabby kid. He's the only person I've ever seen with green teeth. Singing in between sets for nothing and then going out and saying that he'd sung at the Club 47. It's so funny now to look back. Eric von Schmidt and Jim Rooney, Baby, Let Me Follow You Down, Garden City, 1979, p. 89.